PLOT: A young boy in a remote medieval outpost under siege from barbarian raids is beckoned to adventure when a celebrated master illuminator arrives with an ancient book, brimming with secret wisdom and powers. 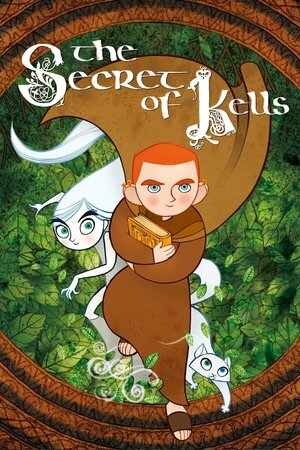 The second film to be chosen in the MovieMuseTV film club is the 2009 French-Belgian-Irish animated movie ‘The Secret of Kells’. Chosen by Pete ‘Thunder’ Forson, the film tells the story of a young boy in a remote medieval outpost, under siege from barbarian raids. He is beckoned to adventure when a celebrated master illuminator arrives with an ancient book, brimming with secret wisdom and powers. You can hear our thoughts on the film in episode 3 of MovieMuseTV and by checking out our review scores below. Pete - "a magical, charming, masterpiece of a film"
Graeme - "a bit empty, despite looking great"
Mat - "certainly interesting, but that is as far as it went"
Simon - "I quite liked the cat"
Gordon - "felt like a videogame, in a bad way"
A hit and miss blending of too many art styles, awful voice acting and an unnecessarily convoluted plot blight what could have been a charming tale.